A stroke is a serious and sometimes life-threatening condition. It is a leading cause of disability and the fourth leading cause of death among Americans. Until recently, if you were to experience a stroke, supportive care was all that was available. But now, stroke management has progressed to a point where a stroke can be stopped in its path. There are treatments available that can prevent or limit disability from stroke as well as save many lives. The success of such treatments is dependent upon how much time has passed since the stroke symptoms appeared. Therefore, early recognition of stroke by the patient or their family is of the utmost importance. This article will attempt to give you the information you need to recognize stroke and respond accordingly. The brain has blood vessels that are dedicated to providing its each and every region with the oxygen and nutrients that it needs to survive and function. Over the years, plaque from cholesterol builds up in blood vessels and causes them to narrow. If that plaque ruptures and causes damage to the vessel wall, the body tries to heal it. Clot forming molecules will reach the site and clot off the vessel. Once the blood vessel is closed, there is no blood flow to the tissue beyond the blockage. Sometimes, the clot will dislodge, travel in the blood and block a smaller vessel downstream. Without oxygen and nutrition, tissue beyond the blockage will begin to die. The symptoms and size of a stroke will depend upon the location of the blood clot. Stroke due to such an underlying mechanism is referred to as ischemic. This is the predominant form of stroke. At least 8 out of every 10 cases of stroke are ischemic strokes. Another less frequent type of stroke occurs when a blood vessel ruptures and causes bleeding into or around the brain. 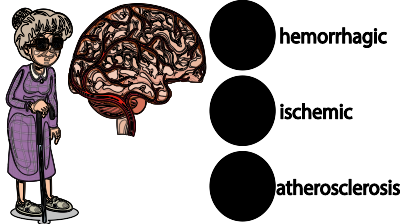 This type of stroke is called a hemorrhagic stroke. Although not impossible to treat, this type of stroke tends to be more serious and harder to treat. Review the healthcare provider algorithm for response to stroke which includes the Cincinnati Prehospital Stroke Scale and take our online quiz for stroke response. Stroke risk is increased by the same factors that increase the risk of a heart attack: smoking, obesity, diabetes, hypertension, and high cholesterol all contribute to the risk of stroke. Anything that you can do to change these risk factors will decrease your chances of having a stroke. There can be a genetic component to stroke risk as well. Because the medical management of stroke will vary depending upon the length of time symptoms have been present, and as this will affect prognosis, a prompt recognition of stroke is extremely important. Keep in mind that stroke symptoms usually come on quite suddenly. They may get worse over time, but they start all of a sudden. (You don’t start to feel worse over the course of a day). You may be sitting at a table and suddenly be unable to hold your coffee cup or get your words out correctly. Signs and symptoms of stroke include sudden onset of weakness on one side, slurred speech or the inability to make your words come out right. A sudden change in the way you walk because one leg is not “acting right” can be a sign of stroke. Some patients notice changes in their ability to see. Loss of balance is another common sign of stroke. Patients who have bleeding around their brain may complain that “they have the worst headache of their life”. Drooping of one side of the face. Ask the person to smile and note if it is uneven. Weakness or numbness in one arm. Ask the person to lift both arms. Does one arm drift downward or is the person unable to lift one arm? Difficulty in speech. Is the speech slurred? Ask the person to repeat a phrase and note any changes in speech. If any of these symptoms are present, it’s time to call 911 immediately. Also, note the time of symptom onset which will be required by doctors to decide on appropriate treatment. It is imperative that you get help and get to a hospital AS SOON AS POSSIBLE following the onset of symptoms of stroke. Treatment for stroke is very time dependent. A clot-busting medication can be given to clear the clot from the vessel, but only if you are at the hospital within 3 hours (4.5 hours for some patients) of onset of symptoms. Call 911 IMMEDIATELY. Do not wait for family members to arrive, do not wait while you pack clothing for the hospital or wait for your family to return a call. The amount of damage done by the stroke is subject to how long the blood vessel remains blocked. Keep in mind that TIME IS BRAIN. For every minute you delay getting care, more brain tissue is being damaged. If you are calling help for a friend or family member, after calling 911, you should attempt to determine the time that symptoms began. If you arrived at your family member’s house and found them with symptoms, it may be advantageous to phone a neighbor that may have seen them. You are attempting to figure out the time that the patient was “last known well”. This may be a telephone conversation, a neighbor who saw them getting their mail earlier in the day or the report of someone who was with them when their symptoms began. This is important because clot-busting medication can only be given within a certain timeframe. What should I do if I am having a Stroke? The Paramedics and EMTs will focus on two things: making sure that your vital signs are stable and transporting you quickly and efficiently to a stroke center that is capable of treating your stroke. Don’t be surprised if EMS encourages you to go to a hospital other than the one that you would prefer. There are certain hospitals that are classified as Stroke Centers of different levels. Comprehensive stroke centers (usually the larger teaching hospitals) are capable of not only giving clot-busting medication but of performing procedures quickly to remove the clot and restore your blood flow. If you are transported to a hospital that is not a stroke center, valuable time will be wasted while they complete their assessment and diagnostic testing and then transfer you to an appropriate stroke center for treatment. Transporting you directly to a closest stroke center can save precious time. Most EMS have protocols in place for this purpose. Treatments for ischemic stroke are described here, which is the most common form of stroke. At the end of this section, you will find links to articles on stroke management which include treatment of hemorrhagic stroke. Remember, for any type of emergency treatment, the earlier it’s begun, the better the results. Clot-Busting Medication: tPA is a clot-busting medication that has been in use for many years for stroke, heart attack, and pulmonary embolism (clots in the blood vessels of the lungs). It is given intravenously and dissolves the clot to restore blood flow. It is not without complications: tPA can cause bleeding in the brain and other parts of the body. So, you will be assessed to make sure that you are not at risk of bleeding. For example, if you recently had a major injury, surgery or internal bleeding, it would be too dangerous to administer a clot-busting medication for your stroke. Clot-busting medication cannot be administered if more than 3 hours (4.5 hours in some cases) have elapsed since symptom onset. After such time the risks outweigh benefits. That is why it is important to know when symptoms began. The time that your symptoms began is the time when the blood vessel became occluded. Percutaneous Interventions: Just like with a heart attack there are procedures to place a catheter directly into a vessel that feeds the brain and remove the clot that is blocking it. A catheter is placed through the groin and threaded up to the blood vessel that has been blocked. The clot can then be dissolved by directly delivering clot-busting medication, or it can be physically removed with the help of a tiny device at the end of the catheter. What is the Standard Treatment for Stroke?